The 20 Inch Paris Bike is a beautifully designed bike for young riders. Whether you’re riding to the park with friends or cycling to the shop, you’re sure to arrive in style with this eye-catching bicycle. The elegant steel carrier basket lets kids bring their toys and accessories with them wherever they go. 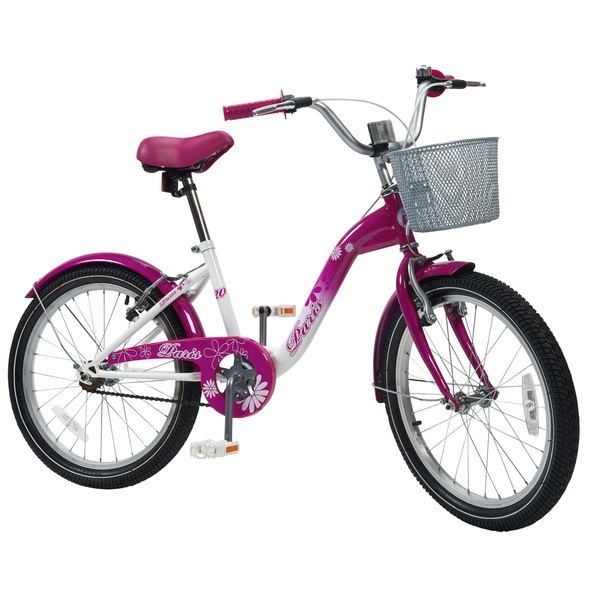 The 20 Inch Paris Bike boasts a strong and durable steel frame in bright pink and white with beautiful floral details and flowing script. The pink height- adjustable saddle and textured easy grip handlebars are designed for the rider’s comfort. Bright pink steel mudguards help to protect you and your clothes from splashes while cycling. The 20 Inch Paris Bike is equipped with a bell and front and rear reflectors to help the cyclist be seen and heard when they’re out and about. The fixed gear keeps cycling simple, while the front and rear V brakes help to protect the rider. The 20 Inch Paris Bike features an alloy rim with air pumped tyres. This is the perfect bike for kids whoant to cycle independently on a bike that looks and rides like a dream.